The Hurst Hairy Olds 442 was a twin engine all wheel drive car that was the sister exhibition car to Hemi Powered wheel standing 'Cuda. I can just imagine how truly "hairy" this car must have been to drive. I recently built a replica of the Hurst Hemi Under Glass Barracuda. 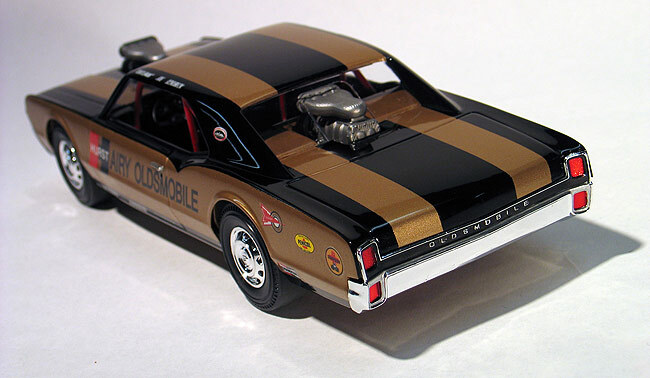 After starting on that kit I realized there would be some efficiencies if I built a replica of the Hurst Hairy Olds at the same time. For this build the I dug into my model collection and pulled out this Monogram kit which was last issued in the late 90's. Because the Barracuda was a much more complicated effort I decided to just keep this one simple and build it out of the box.